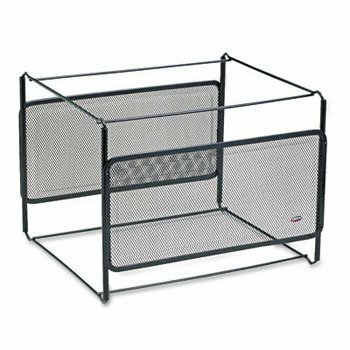 Wire mesh file frame holder is made of durable rolled mesh steel; holds letter size hanging file folders (sold separately). Keep your desk clean and clutter-free. Holds letter size hanging file folders (sold separately). Contemporary mesh design adds style, efficiency and productivity to your desktop. Global Product Type: Hanging File Folder Racks-Wire Mesh; Hanging File Folder Rack Type: Wire Mesh; For File Size: Letter; Capacity (text): 8 11/16 in. View More In File Folder Frames. If you have any questions about this product by Eldon, contact us by completing and submitting the form below. If you are looking for a specif part number, please include it with your message.